Garam Bheja Fry: Enter the GBF reporter!! Hii!! A bhery Guud Mauning to all thee pippal reeding this bilaag!! (and u say ki u have finally some evidence that I injured my head last month!). The GBF reporter is back after a much celebrated and long hiatus to your chag'rin' supreme. 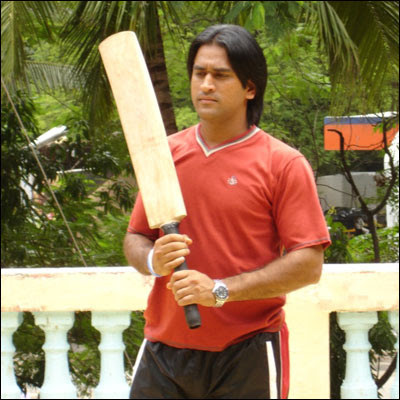 The reporter is all nostalgic about the T-20 world cup, those giggly and at times sultry dreams clad in cargoes and tank tops, their skilled err..otic pelvic thrusts delivered to the living room well appreciated by both Jaccha-Baccha (parents and children), Barrels of Drool, Aahhh and yeah there was this one batsman..what was his name? umm ....yeah ...was it 'yuvraj paadukone'? umm ..may be ... who attempted to entertain us as well. The GBF reporter has recently noted that Salman khan has been "tussauded" (wax statue unveiled at madame tussauds) and the Bollywood directors are in a state of dilemma as to who's the better actor of the two. Already few producers have approached the 'waxed salman' staue with hefty signing amounts. They believe that under the hot scorching sun the wax statue could give any actor a run for their black money with those lively and 'moving' facial expressions. Salman is up for some stiff competition. Phewh! "Kahee katrina ko ye naa pata le!! bada saxy.. oops i mean waxy hai ye"
I have heard Riya sen is also gonna be tussauded but instead she has decided to stand there 8 hrs daily, masquerading as the wax statue. "This girl has some serious talent" says the manager of the museum. Anyways she says she's looking for some good scripts, and she won't compromise on that notion. Recently she has signed a movie in which she will be playing the postbox, quite a demanding role it is, she says and the Madame tussads experience will come in handy. "Haaye rabba! kiska haanth hai ye"
The other important piece of news coming in, is that the TATAs have launched the NANO - the much awaited 1 lakh car. 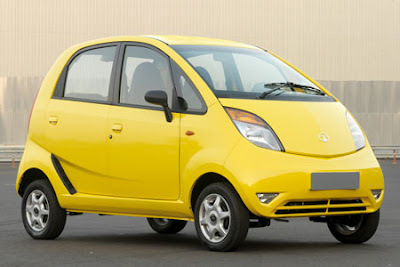 After the 1-lakh-maintanence/year car INDICA, they have moved on and launched the nano , which promises to be the Cab-waalahs delight, They are really excited as they have learnt that it has 21% more space than Maruti 800, and so they have more space to pull off 'those' (pronounced like 'thooooose' with raised eyebrows and a cheap smile) maneuvers and stunts with the night shift waali female BPO staff. Ab samajh jaao uncle! Ab live telecast dikhau kya?? Moreover it has been reported that the car can clock a maximum speed of 90 kmph. People here in bangalore say "K.O" to that.and you ask "Wtf K.O.??" arey bhai knock that 'K Out' from that 'kmph'. 90 metres per hour is a luxury here. Tere ko kya lagta hai jhooth bol raha hu?? Beta kabhi bangalore aaiyo. Station se mere ghar tak pahuchne me hi tere vacations khatam ho jaayenge!! "Ab mai kya bolu!! car hoon insaan thode hi hoo"
Deepika paadukone was initially high on MSD but then Yuv razz matazz happened and ‘honi se ho gayee anhoni, aur bevkoof ban gaya dhoni’. Aur 7 up peeta reh beta. 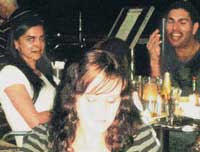 GBF reporter was appalled at the sheer state of 'affairs' which involved DPka padukone. or was it pad-kone or padded cone. I leave it to your imagination. Deepika (while gritting his teeth) : "Oye shakal theek kar, aisa lag raha hai table ke neeche kuch ho raha hai"
Yuvi : Arey bada mazaa aa raha hai hewhewhew..lagda hai mainu chadh gayee hai..oye dhoni meri taang me gudgudi kyu kar raha hai be...hehehek nikal bahar table se"
"Uff ye bedard zamaana aur ye tanhaai..dost dost naa raha..saale yuvraj teri monkey, wapas aa beta batata hoon"
And then last but not the Beast- Andrew Symonds. Who incidentally is pretty disgusted with Vijay mallya. And u ask why Vijay mallya?. Recently reports of Vijay mallya entering the F1 circuit hit the headlines, and so Symonds has nourished a notion that Vijay mallya is encouraging 'racism'. Fair thought though. Symos is ‘fishing’ for the ‘king’. (of good times). Our inside sources tell us that Symonds hands over the 'keys' of his locker to his captain each 'Mon’day. God knows why! So this was the week's wrap up from your very own underpaid GBF reporter. The hit count has crossed 30,000. I yumm happy. Comment bhi kar dena nahee to 'teri monkey...'! hehe!! byeee! Oye....mera pehla.....That was full of humour !!! Wiat Bheja fry !!! Main aap ko ek achi khabar sunata hoon !!! Harbhajab must hav uttered the words 'MAA KI'. Now our poor symonds does not know hindi..He has mistaken it for monkey and from then the case is on.... SO harbhajan hasnt called symonds as monkey !!! Support Bhajji !! Sell the plates while it is hot !!! The certainty of growing old. That north and south can't get along. That east is east and west is west. .. But I believe in You. Todu fodu! Prabhu!!!! Kahan se...kahan se itna khatarnaak content aur writing iskils laate ho aap! Aaapki aankiyon mein jo aansu aaye...hamara iscrap padh ke....aur fir jo aapne hamare iscrap ka jawab diya...uske liye bahaut bahaut dhanyawad! u r back in action! daily dose kardo isko toh! life eej a hard...mint rox...nah gbf rox! kareena kabhi saif ko chuno..
mast tha, Monkey ka raaz raaz nahi raha ab..
welcome back abhi, mast post as usual! LMAO. I'll drop dead laughing my head off. laughter the dose fir se mil gaya boss.. kitthe gaayab rehte ho??? Oyeeeee..NANO se yaad ayaa...Mujhe autoExpo dekhne jana tha :( :( :((!!!!!!! Hum log ki entry bhi freeee thiii :(( :(( :((...kambakht college evam ghar ke kaam!!!! buhuhuhuhuhuhuuu!! Aur mubaarak ho..le shagun ki 11th plate mere naam :P! Chavanni ki deal hui thi,gyarah rupay dekar ja ri hun..jee le apni zindagi :P! khabar wahi jo sach dikhaye! Flexing my literary 'grey' muscles!! The Gr8 Indian Train Journey! !